Thank You & See You Next Year? We wanted to thank all of you for participating in the Year of Feminist Classics project in 2011. We know we have not been the greatest hosts, at least 3 out of 4 hosts experienced some difficulties this year and because of this we were absent a lot more than we should have been. Nevertheless, we hope you found this project as fulfilling as we did. Moreover, we hope you will consider joining us next year! We are still putting the details together and we hope to reorganise a little so as to make the project more workable for all hosts. More details will follow in the upcoming week or so, we are just putting the final touches to the list. In composing it, we have aimed to take your recommendations and comments on the 2011 list in account. If there is anything you think we should consider, be it in books to read or organisation-wise, please feel free to leave a comment. Again, thank you for joining in on our somewhat messy, but hopefully worthwhile, journey into the works that have defined and changed feminism through the years. Happy 2012 to all of you! Having seen Audre Lorde referenced all over the place within feminist circles, I was relieved to finally read her work for myself. This collection was more diverse than I thought it would be. I wasn’t expecting so much about poetry as a means of expression, for example, or the first and last pieces about Russia and Grenada, respectively. And honestly, I didn’t find those topics as striking as the others. My favorite parts of Lorde’s essays were the ones in which she details some of the microaggressions she faces regularly as a black, lesbian, feminist woman by feminists and non-feminists, men and women, and people of all races alike (the bullet points on p. 126 in the essay “Uses of Anger”, for example). These allow us to see just how insidious notions of superiority really are, and how easily dismissal of others disguises itself as something benign. As Lorde makes clear, this is no less true for feminists than it is of anyone else, regardless of their academic standing or level of “awareness”. This is a really important criticism that remains relevant as feminists (and others) continue learning to understand each other better through the acknowledgment of difference while moving away from generalizing experience in attempts to build solidarity. Did you find her response to this question convincing and/or satisfying? Do you think the criticism itself is valid? How do you understand the relationship between anger and oppression, or anger and feminism? Is there one? What kind of role can/should it play? Why does it so often seem easily dismissed? How do we recognize the master’s tools for what they are? Finally, I was interested in Lorde’s discussions of parenting a boy as a lesbian feminist in an era when separatism was more seriously regarded (by some) as a serious option. In recent years I’ve seen a lot more discussion about not only feminist parenting, but feminist parenting of boys, which I see as a really positive development. Girls seem to receive the bulk of feminist education, be it from their teachers or their parents…but boys need it too! I don’t have any specific questions about this, but if any parents would like to weigh in on what they thought of Lorde’s essays on the subject, or on their own experience, I’d be delighted. Anything else? If there’s something you’d like to discuss or think I’ve neglected anything important, do feel free to bring it up! Oh, and please stick around for updates on plans for 2012. We may have slacked off on hosting duties at times (ahem, sorry)…but I know the first year of feminist classics has been both challenging and fulfilling for us and hopefully some of you as well. Looking forward to hearing from you (even if it has to wait until the holiday season has passed) and thanks for your participation! I am excited to be hosting discussions about Sister Outsider this month, as I’ve been looking forward to this one all year! I know that many of us will be very busy leading up to the winter holidays, but most of these essays look short and, well, anything’s bound to feel a breeze in comparison to Butler! (I admit that I did not get to it last month, but have struggled through the section on performativity for many a college course). 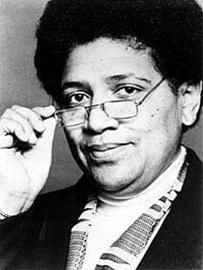 According to Wikipedia, Audre Lorde was, in her own words, a “black, lesbian, mother, warrior, poet” who wrote throughout the ’60’s, ’70’s, and ’80’s. Like bell hooks, she wrote compellingly about racism within U.S. feminist movements and argued that recognition of, and respect for, differences amongst women is crucial for any movement seeking to build meaningful relationships of solidarity between them. This is pretty standard feminist discourse, now, I think; back in Lorde’s day, though, this was a highly contentious claim and a lot of other feminists reacted defensively, marking her an “outsider”. In her essay “The Master’s Tools Will Never Dismantle the Master’s House”, Lorde attacked the underlying racism of feminism, describing it as unrecognized dependence on the patriarchy. She argued that, by denying difference in the category of women, feminists merely passed on old systems of oppression and that, in so doing, they were preventing any real, lasting change. Her argument aligned white feminists with white male slave-masters, describing both as “agents of oppression”.